Week eight in Major League Soccer can probably be best described in a couple words. Ho-hum. After Wednesday’s interesting clashes and Friday’s debut of Soccer Night in America, the weekend bill brought loads of draws and yet another star player with a broken bone. 1. Bitter win for RSL. There is no simple way to put it, the loss of Javier Morales for RSL is devastating, even for a club with so much depth. The tackle by Marcos Mondaini was reckless and careless but seeing the replay over and over again was terrible. I for one feel bad for Real Salt Lake in all of this as they were easily the better team on Saturday with a two-man advantage but emotions were taking their toll on the club in a big way. No doubt in my mind it was a nasty injury. I understand ankle injuries as much as the next guy, I played through them and still suffer from them to this day. But seeing Morales’s ankle bent the way it was broken was a whole new level of nasty. 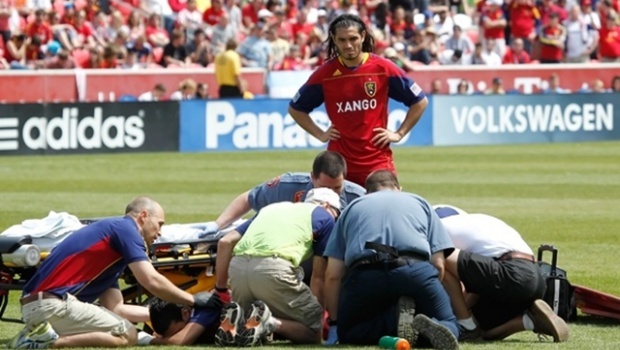 Unlike David Ferreira’s injury, this one can’t be blamed on the field that it happened. It was all result of a stupid foul. RSL will still be a contender though, even without Morales. Jason Kreis and company will find a formation and a plan that works for their club and will do whatever they can to execute it. Remember, they only have the USOC to worry about along with their regular season slate this fall so the schedule is definitely more in their favor to do well this season. 2. Punishment for Mondaini will be all the rage today. No doubt the hot-topic of discussion today will be whether or not Mondaini receives the same kind of suspension that Colorado’s Brian Mullan got or something less. The two situations were completely different and yet a lot a like. Both were reckless, no doubt. Mullan had more intention on Steve Zakuani for not getting a call his way earlier in the game while Mondaini was just careless in going for the ball. There’s no doubt Mondaini should at least get a handfull of games for punishment here. Its amazing to think that just before the season Don Garber talked about protecting players like Morales, Zakuani and David Ferreira and yet here we are, eight weeks into the season and big names like those three are down for a long time due to silly plays on the field that could have been prevented. 3. No excuse for LA or NY now. Even though I see Dallas, Seattle and RSL still in the hunt for being a contender here this season (okay and loop Philadelphia in there as well), both the LA Galaxy and the New York Red Bulls really have no excuse in my mind now to not win their respective conferences. New York is brought into this discussion more so for the Supporter’s Shield while LA is more for winning the West. With three of LA’s biggest competitors missing key players for extended amounts of time this season, they really should have little excuse to run away with this conference again this season. Still they haven’t yet. Either has New York. Hmm. 4. More JELD-WEN magic for Portland. I still have trouble rating how the Portland Timbers are here right now (you’ll see more of this in my Power Rankings tomorrow). While I have to applaud what they do at home, not getting results on the road doesn’t help their cause very much. But what it is doing is showing that no matter how good of a team you are, getting even a point at JELD-WEN Field isn’t easy. Case and point on Friday night against Philadelphia. The Union played some solid defense for the majority of the game and held some decent possession but the smaller field really did a number on how their offense could get going. Their one quality chance got wasted when Danny Mwanga took a touch too many instead of laying it off to Sebastien Le Toux. All credit though still goes to Portland. Their set piece magic continues to impress too and their defense getting another shutout at home has to be a good thing for John Spencer. 5. Rough week for Houston. First the Dynamo hear they’ll be without Brian Ching for another few weeks, then they go out and lose to Colorado on Wednesday in a sloppy effort at home, and then lose again on the road to Toronto on Saturday. Two ugly losses really put a dark cloud over the positive stuff that they had been doing for the last month or so here in this season. Offensively they had no spark and defensive they began to look a little lost like they were a year ago when they let in goal after goal. They’ll pull through this funk but Dominic Kinnear can’t allow his club to linger in it for long. 6. Last five games of the weekend in level. Just comes to show you, early on in the season when teams are battling injuries, scoring issues, defensive problems, or just chalking it up to parity, lots of draws happen. Case and point to this weekend. Five of the seven games on Saturday ended level. After watching a couple of them that night it was clear no one was really better than anyone else too. Dallas had no bite to their attack while D.C. failed to figure out Kevin Hartman. Seattle could have done better in Columbus. Chicago-Vancouver and New England-Colorado both bored people to death. And then there was LA and New York. Solid game with plenty to offer but in the end a Tim Ream save and a Dane Richards shot off the post kept this game nodded up at one goal a piece. 7. LA and NY show quality. Even with the call-out in the point above, these two showed a lot of good stuff on Saturday night. I thought they closed out what was a rather dull and depressing kind of day with a very entertaining 90 minutes. As much as it pains me to say it, this is what the league wants on a national showcase. Their two biggest profile clubs duking it out on national television. Just a shame in a way that the game couldn’t have been earlier in the day for the rest of the country to see it in primetime (why wasn’t this game on Sunday evening?). Still, what these two clubs do best was evident on Saturday night. The attacking flare was out there and yet both defense rose to the level of the event itself. I’d love to see these clubs meet again in the post season but it will likely have to be a MLS Cup for that to happen. I’m sure the league wouldn’t lose sleep over that thought. Whaaah! Smaller field in Portland. Whaaah! It's within FIFA international guidelines. Stop making excuses for visiting teams. Did you even watch the game? Timbers have been the better side in each of their home wins.